I’m excited to announce that Crayon has raised $6M in Series A funding led by Bedrock Capital with participation from existing investors, including Baseline Ventures, Converge, Box Group, Oyster Funds and both new and existing angel investors. We’re honored to be partnering with Bedrock Capital and Eric Stromberg, co-founder and partner who led the round, to scale Crayon and bring real-time competitive insight to every business. Last year, Crayon grew 300% and brought on hundreds of the most sophisticated customers, including Fortune 50 enterprises and high-growth startups alike. They, too, saw a growing need to capture the exponential wealth of market data available on the web, extract competitive insight, and drive impact in every corner of their businesses. Crayon customers have seen sales win rate increases of more than 50% and time savings of at least 20%, among other benefits, and we’re just scratching the surface of what we can do with this intelligence. Crayon started by tackling the challenge of capturing complete information about a company’s every move, and organizing and filtering that data to surface meaningful updates. As a result, we’re now tapping into hundreds of millions of sources programmatically and analyzing tens of thousands of data points per day to identify actionable insights. In this next phase of Crayon’s development, we’re going deeper to analyze trends, using a combination of human and artificial intelligence, to surface relevant and actionable insights. And we’re committed to helping businesses act upon those insights. In the last four months alone, Crayon released dynamic Battlecards to enable sales teams to win more competitive deals, along with Salesforce integration and integration with popular sales enablement platforms to ensure competitive resources can be leveraged by sales teams in real-time. We’re excited to help more businesses use competitive insight to enable their sales teams to win more deals, improve their marketing performance to break through crowded markets, and inform their product strategy to build the best solutions. We’re also releasing today the second annual State of Competitive Intelligence Report, diving into the best practices and results seen in the field of market and competitive intelligence (CI). More than 1,000 professionals responded, sharing their practices, challenges, and results seen from their CI efforts. It’s no surprise to discover that markets are more competitive than ever. 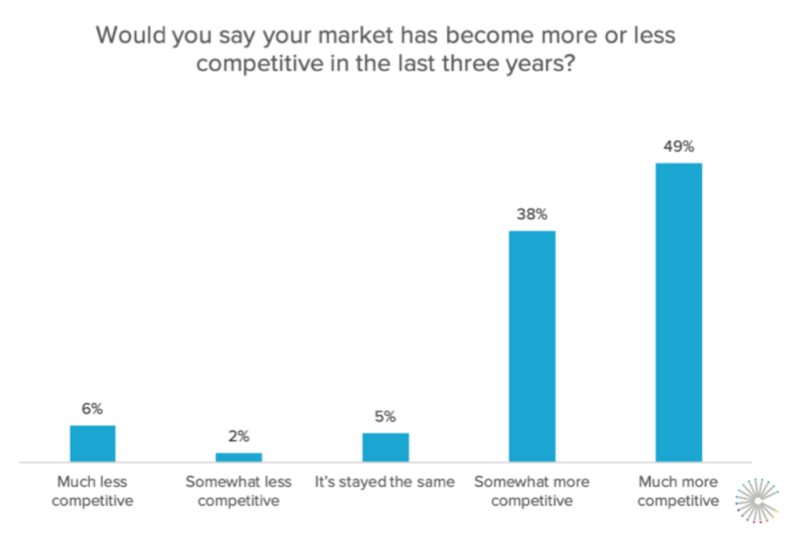 On average, businesses battle 25 different competitors, and 87% say their markets have become more competitive in the last three years. Getting a handle on your competitors’ movements and enabling your teams to win against them is an ever-growing challenge. Businesses are already seeing a wide range of benefits from CI, both quantitative and qualitative. Many are driving both strategy and tactical programs and seeing meaningful increases in bottom-line metrics like revenue. 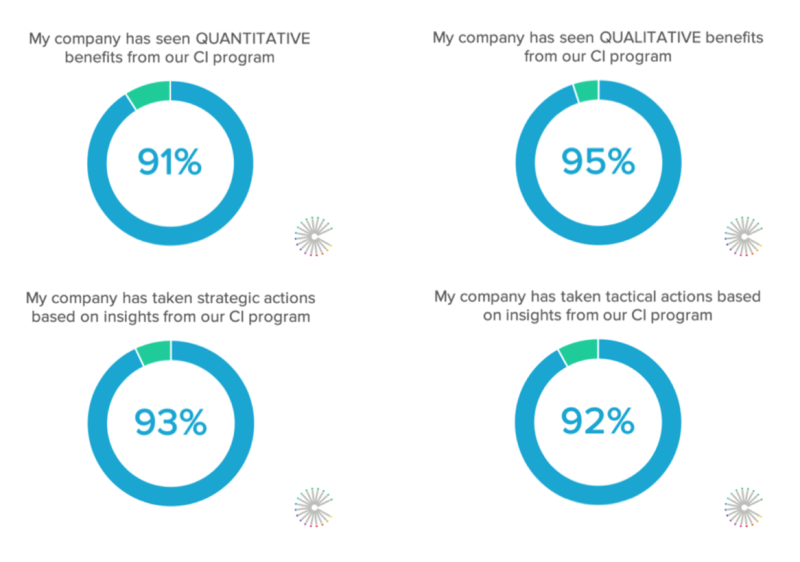 One key determining factor for seeing success with CI was getting the intel to all of the relevant stakeholders across sales, marketing, product, and executive leadership. Today, most businesses rely on traditional communication methods - 79% share intel by email and 62% share intel live, in meetings. The study also found that the more frequently intel is shared with those audiences, the more likely they were able to see positive results. 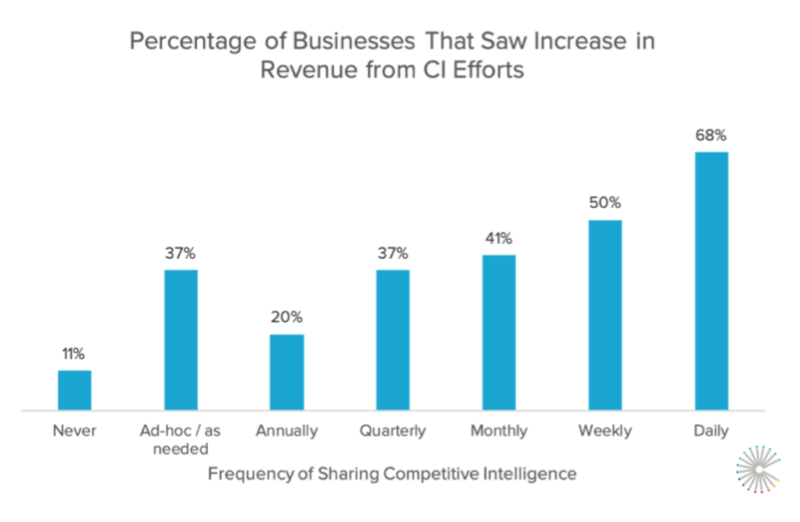 For example, those who share intel daily are 84% more likely to see a revenue increase than those who share intel on an ad-hoc basis. These are just a few of the findings from the 2019 State of Competitive Intelligence Report, the largest (and second annual) study on this field. You can view and download the full report here. With 80% of businesses already investing in CI and 87% reporting their markets getting more competitive, we’re excited to be tackling this challenge now and bringing real-time competitive insight to businesses. We doubled our team last year and plan to do the same this year, so if you’re just as excited about helping businesses win in this competitive world as we are, join us. Thanks to all the Crayon employees, customers, investors, advisors, partners, spouses, friends, and everyone else who has believed in Crayon along the way and helped make our vision a reality. We’re committed to proving you were brilliant to support us.